We are excited to announce that we plan to hold a Nuido Trip in Japan, associated with the World Exhibition 2020, from March to April 2020!! This trip is open for JEC members who are Phase 10 and above. *Phase 10: Those who completed phases 1 through 9 and are accepted to enroll in the class. Please contact the JEC office to obtain necessary paper work. Phase 10 Class will only be held IF we have 5 students or more. Advanced Class and Teachers Class: Those who have previously attended Phase X class. We will be meeting at the hotel in Kyoto the most historical city in Japan, on March 28 while the splendid cherry is still blooming. We will be visiting artisans and other special places exclusive to JEC members. Our long awaited World Exhibition will be held from April 1-5, 2020 at the Tokyo Ginza Art Gallery Museum. This is the venue where Kurenai-Kai, the main Japanese embroidery school in Japan, normally holds their domestic exhibition called Zenkokuten. This time, for the World Exhibition, we will be doubling the space we ordinarily have. The title “World Exhibition” means the exhibition is for Japanese embroidery pieces which were stitched by embroiderers from all over the world. This will be a chance for all of us, who are scattered around the world, to gather in Tokyo and share our love for Japanese embroidery and Nuido. The Fractal Project, one of the main pieces, will be there to attract people’s hearts. Although the exhibition will be open to the public from April 1 through the 5th, we have a special “Member Day” on March 31. Kurenai-Kai and JEC members are welcome to “preview” this special event before it is open to the public. It is not necessary to be signed up for the Nuido Trip in Japan in order to attend the Member Day. Photographs are only allowed on Member Day. We will meet Kurenai-Kai members for a Get-Together Party after the preview. 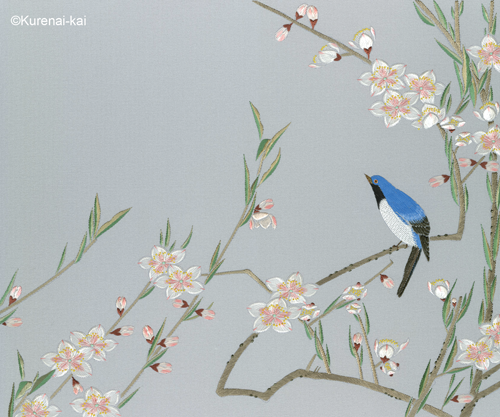 We are thrilled to announce that the embroidery design “Peach Blossoms with Small Bird”, inspired by Ito Jakuchu, will be taught in the Special Advanced Class (instruction given on first 3 days and then self-study). This design was originally finished as a Kakejiku scroll, and you will be able to have yours made into one if you so wish. The head instructor will be Yamashita-san, chief of the Kurenai-Kai workshop, who has been a professional for many years at Kurenai-Kai. Simultaneous English interpretation will be given. 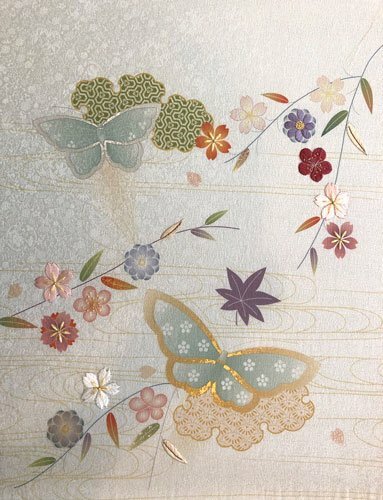 Please take this rare opportunity to learn the unique expressions, which were born from Ito Jakuchu’s distinctive painting, and immerse yourself in stitching at the home of Master Iwao Saito. You are allowed to bring and work on other pieces, but since this will be a special and rare opportunity, not even available to Kurenai-Kai members until this class, I hope everyone will take this opportunity to work on this piece!! Phase 10 Class will only be held IF we have 5 students or more. This class will be held from April 1-5 at the same time the Special Advanced Class, but it will be held in a different classroom. After a rest day on April 6, the Teachers Class will be held. This will a repeat of October 2019’s Teachers Class on the new Phase 1. Attend the full schedule: March 28-April 11 (15 days). With this option, you will attend the Kyoto trip, the World Exhibition preview, Get-Together Party with JEC/Kurenai-Kai members, and the first class (Special Advanced Class/Phase 10), as well as Teachers Class. Attend a partial schedule: March 28 – April 6 (10 days). With this option, you will attend everything except for Teachers Class before leaving Japan on April 6. Option 1 (full schedule/15 days): $3,900 US. Option 2 (partial schedule/10 days): $3,200 US. A non-refundable deposit of $300.00 USD is required. PLEASE REMEMBER that this trip is on a first come, first serve basis. When the number of participants reaches the maximum, the registration will be closed. The rest of the payment will be charged to your credit card later on. There will be NO other refund option for events/days which you will miss during the given time. If you are eligible for the trip and are interested in registering for the trip including trip fee, or have any questions, please contact at [email protected].